Samsung Electronics Co. has officially launched a new version of the popular Galaxy Tab in South Korea, its home market. 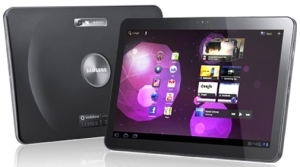 The new tablet is code-named Samsung P7100 or Galaxy Tab 10.1v and as the name suggests it comes with a 10 inch display. TechCircle.in had earlier mentioned about the tablet in our feature on the popular tablets in the market and the actual specifications of the tablet differ minutely from what we had estimated. The tablet has a 10.1 inch TFT touchscreen display (1280x800 pixel resolution) and runs on the Android 3.0 (Honeycomb) operating system (hope the OS is updated soon since Android has already come out with Android 3.2). It is powered by a Dual-core 1GHz ARM Cortex-A9 processor with ULP GeForce GPU, Tegra 2 chipset and comes with 16/32 GB of storage capacity. All of this is an improvement from the Samsung P1000 which had a 7 inch screen, ran on Android 2.2 (Froyo) OS and had a 1GHz ARM Cortex A8 processor, hence the new tablet is more powerful, more efficient and offers the consumers with a bigger display screen. Samsung P7100 has an 8.0 mega pixels auto-focus camera with LED flash and it can record full high definition (1080p) videos at 30fps. It also has a 2 mega pixels front facing camera for video chats making both the rear and the front cameras better than the ones in the iPad 2. For better sound Samsung has added speakers with surround sound in the tablet. The dimensions of the tablet is 246.2mm x 170.4mm x 10.99mm and it weighs at 589 grams (it's lighter than the Apple iPad 2 which weighs 607.813 grams). It comes with A-GPS, supports Adobe Flash 10.2 and also works with the entire suite of Google services like Gtalk, Youtube, Google Maps, Gmail and more. It has a Li-Po 6860mAh battery and Samsung claims it is capable of providing 10 hours of video playback and a staggering 1810 hours (more than 2 and a half months) of stand-by time. It is available in the black colour and the price of the device starts from $500 in the U.S. market, similar to the price of the iPad2. Since the Samsung P1000 just had a 7 inch screen, we can say that the new tablet will be a much better competitor of the iPad2 which has a slightly smaller screen size of 9.7 inch. The tablets is yet to hit the Indian market but according to Blackfridaydeals.in, the 16GB and 32GB versions of the tablet will have a price tag of Rs.22,379 and Rs.26,864 in India, which makes it cheaper than the iPad2 by a reasonable margin since the iPad2 pricing starts at Rs.29,500 for its cheapest version. We will update you with the Indian launch date and price as soon as it is announced by the company, which should be soon since it is already available in the US and other parts of the world.